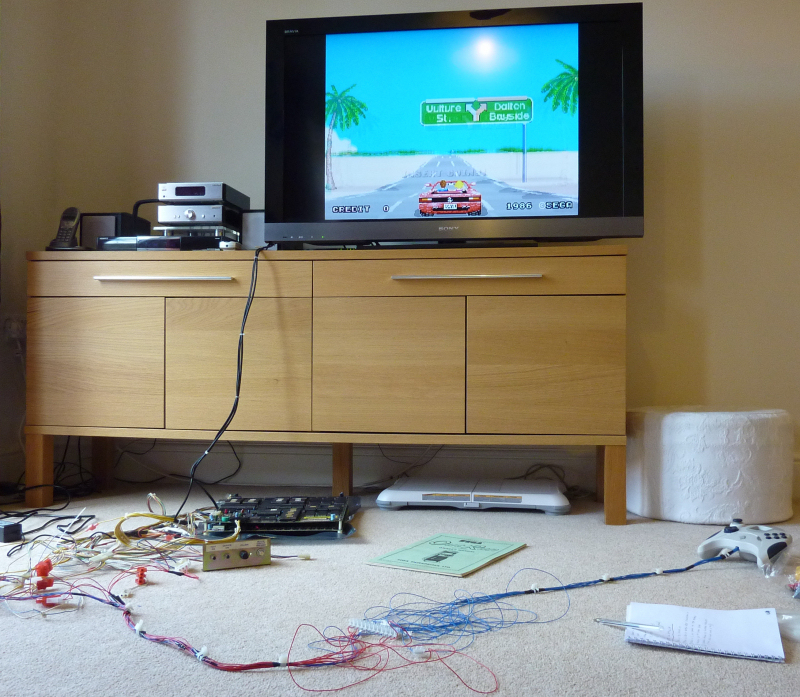 The aim of this project was to have a fully playable OutRun PCB in my lounge, without the overhead of the original controls or cabinet. As an extra requirement, I wanted to be able to swap the original control panel in if desired without any complex rewiring. The original hardware consists of three analog controls: the accelerator, brake and steering. 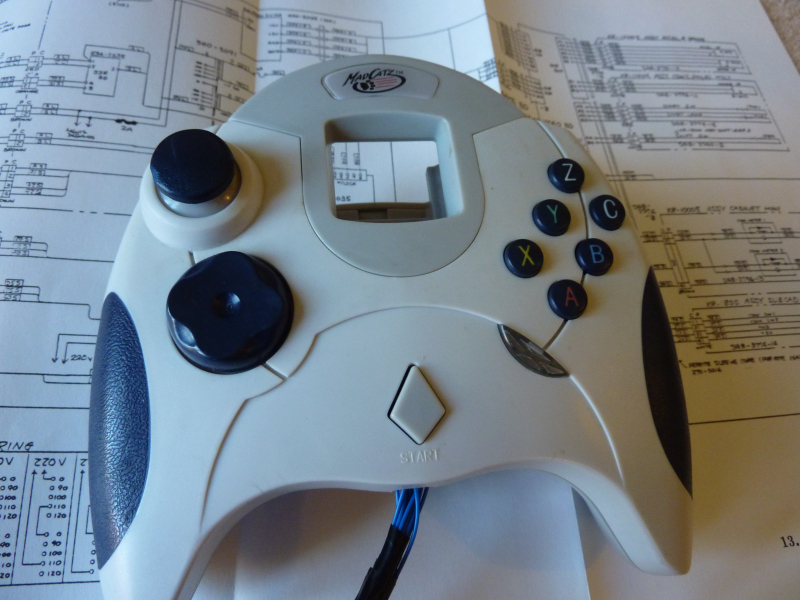 A perfect replacement pad appeared to be the Dreamcast controller. It contains two analog triggers, which we can map to acceleration and braking plus an analog thumbstick for the steering. Unfortunately, the original Dreamcast pad uses hall effect sensors for the analog controls and would be unsuitable. 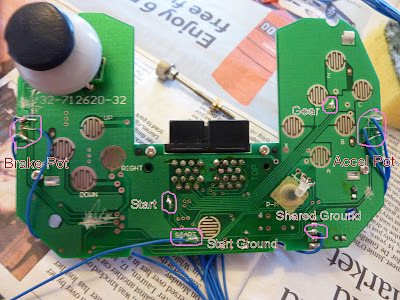 Thankfully, many of the third party controllers aren't made to the same standard and instead use cheaper potentiometers, just like the original arcade hardware! In addition to this, there are plenty of digital buttons we can map to things like the gear change and the start button. I plumped for a Madcatz Dreamcast pad. It's a nasty piece of work, but suitable for rewiring. I cut the original cable off, bypassing the pad's logic circuits and soldered wires directly onto the necessary components. One problem is that many of the components are connected via the pad circuity in a way that makes them unusable. For example, the buttons share a ground connection and the pots are also connected. You'll want to use a continuity tester and cut the PCB tracks between the components. Thanks to some forum assistance, I found out that the connectors on the OutRun wiring harness are 'Amp Mate N Lok' which can be bought from Swallow Amusements. 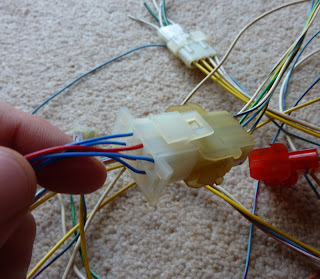 Using these connectors, I was able to create a wiring harness that would plug straight into the original OutRun wiring loom. It's possible to create your own plugs without buying an official (and expensive) crimping tool. You can simply add solder to the wire, press it into the crimping pin and hope it makes a firm connection. When it does, crush the crimping pin around the wire with some pliers. It might take some time to get it right, but you can still achieve decent results. Here's a video of the final setup in action! Long time no speak. I can't believe it's been 10 years!